A history of eclipse glasses and injuries. If you haven’t gotten yours yet, start building a pinhole camera. We know intuitively that staring at the sun is a bad idea, because every time we do it, our eyes water and start to burn. “Solar retinopathy,” the formal name for the damage, occurs when ultraviolet light floods the retina, scarring your eyes with something akin to sunburn. As little as two minutes of sun staring can cause permanent damage to the eye. Usually, the pain of staring at the sun is enough to turn our gaze before we inflict permanent damage on our eyes. And this is why eclipses are uniquely dangerous—when the sun is partially covered, our natural response to look away is dulled, though the risk of injury is not. 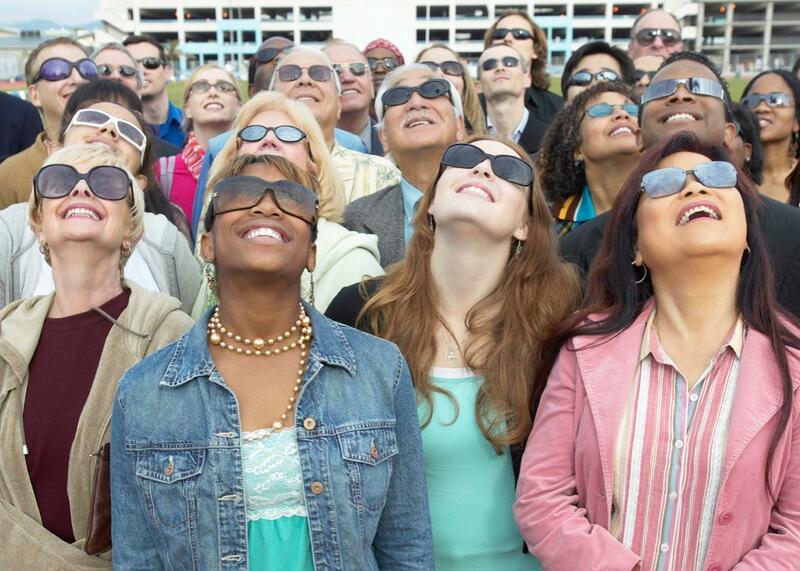 The eclipse glasses you have been hearing about fix this problem by blocking out almost all violet light, and all ultraviolet light, protecting our eyes from the danger of the sun while allowing us to stare sunward, enjoying the beauty of the eclipse. Of course, we haven’t always known the ins and outs of solar retinopathy. While there aren’t well-documented stories of large groups of people sustaining eye damage, one imagines that sort of thing must have happened centuries ago when both knowledge and literacy were in short supply. And even more recently, there is no shortage of people who have suffered injuries because of eclipses. During the 1976 eclipse, for example, a total of 58 people in Turkey were taken to the doctor and treated for eclipse-related eye damage. While their vision mostly recovered, some patients sustained damage that would stay with them for up to 15 years. Oregon resident Lou Tomososki recently told the Today Show about the vision damage he sustained during a 1962 partial eclipse that affects him to this day. There’s even a legend that Isaac Newton himself attempted to watch an eclipse through a mirror and ended up blinding himself for three days. He suffered months of after-images, but eventually his vision recovered. 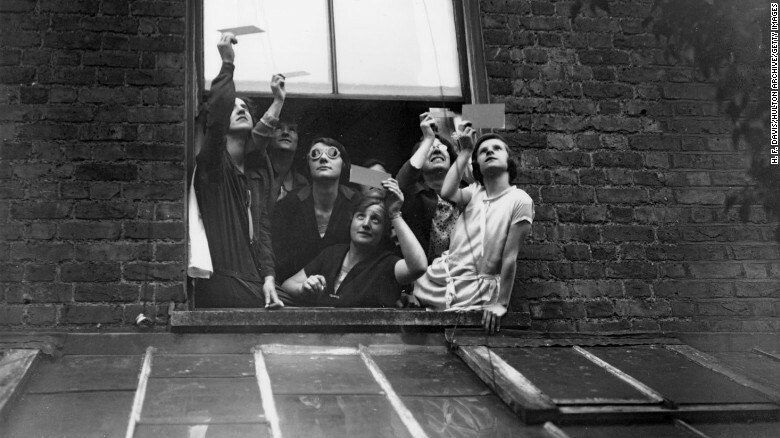 Newton perhaps should have known better—scientists who lived before he did figured out how to safely view an eclipse—and it wasn’t through a mirror. In the fourth century, Aristotle revealed how he watched the eclipse in his writings, contemplating how light bends during the events—“Why is it that an eclipse of the sun, if one looks at it through a sieve or through leaves … the rays are crescent-shaped where they reach the earth?”—outing leaves and pasta colanders as his preferred methods for eclipse viewing. While watching the shadows of an eclipse pass through another object would have protected his eyes, it wouldn’t necessarily have been the best show. A better version of this idea came 600 years later when Ibn al-Haytham, an Egyptian scientist, used the first pinhole camera, also known as a “camera obscura,” to view the eclipse as safely as we do today. These cameras project the image of the eclipse onto a viewing screen so people don’t have to stare directly at the sun to see the show. But as Aristotle’s teacher taught every freshman philosophy class, seeing the shadow of a thing isn’t seeing the thing itself. And thus more direct means of viewing were born. In what was the first telescopic viewing of a full solar eclipse, King Louis XIV of France covered his telescope’s objective lens with a piece of smoked glass to dilute the harmful light. This method remained popular through the early 19th century. By 1932, smoked glass had started falling out of favor. Steve Ruskin, Ph.D. from Notre Dame and author of America’s First Great Eclipse, told me it was then that products like the “Eclipse-o-scope,” eyeglasses with protective film covering the eyeholes, came to market, claiming to provide enough protection to look directly into the sun. Neither smoked glass nor the Eclipse-o-scope were actually fail-proof though. An article published in 1947 in the Journal of School Health by Paul Tower, M.D. , describes vision issues suffered by 32 children who used smoked glass to view the eclipse as it passed over Los Angeles. He concluded that smoked glass, film, and dark sunglasses don’t provide sufficient eye protection from the sun. Instead, current eclipse lenses are made from black polymer, a resin containing carbon particles, which is used for all sorts of solar filters. Even more important than containing black polymer, however, is that glasses be ISO 12312-2 certified. This designation, whose requirements are set by the International Organization of Standards, is the one NASA recommends for eclipse glasses. As Rick Fienberg of the American Astronomical Society told Forbes, these glasses reduce the sun’s brightness by about 500,000 times—compare that to regular sunglasses, which only reduce sunlight by a factor of five. NASA also recommends purchasing glasses that come with the manufacturer’s name and address printed on them. This ISO standard is especially important given the number of “fake” or otherwise ineffective glasses that have been sold on retailers like Amazon. The exact number of fake glasses sold is still unclear, but consider that Elijah Wolfson from Quartz investigated the first 140 eclipse glasses listings on Amazon and found that 21 of them did not claim to have ISO certification. Only 33 of them identified the name of the manufacturer. Worse, some of the glasses that did claim to have ISO certification or were stamped with their company’s name were complete fabrications made of substandard material less protective than is necessary. Huge demand and unscrupulous sellers have affected the price of eclipse glasses as well. Over the last three weeks, their average price has more than tripled. Which might mean that at this point, your best bet is making your own pinhole camera for safe viewing. Luckily, NASA’s got us covered on that front, too.